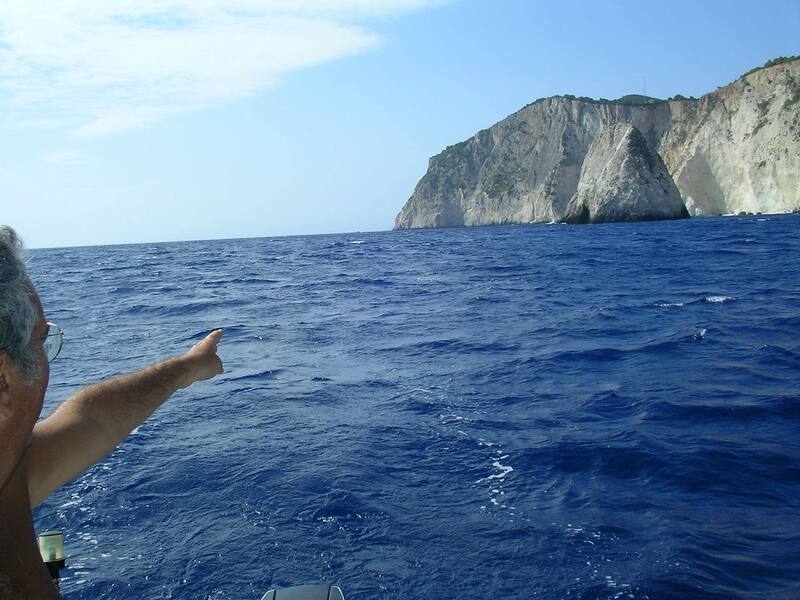 On August 2005 I had a chance to visit Zakynthos (in Greek Ζάκυνθος, in Italian Zante), a Greek island in the Ionian sea lying almost in the same parallel (37.79′ N) as my native town Messina (38.11′ N) which, by the way, had been a Greek colony founded in 740 B.C. and named in Greek Ζάγκλος, in old Sicilian Zanclo), that is sickle, because of its natural harbour shape. 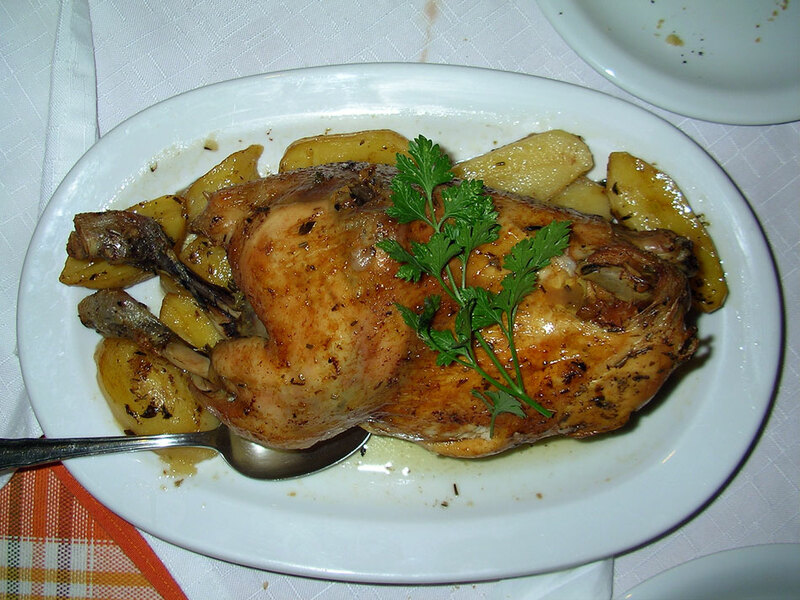 This cultural, and may be old genetic link, which I feel with Greece, gives me a sense of belonging whenever I visit this beautiful European country. The occasion was spurred by the desire to meet a friend I hadn’t seen, for various reasons, in ten years; and what impressed me most from this encounter was that he looked quite the same, or rather, he looked better because he had quit smoking and had been living almost all that time in California; he has just put some weight on: you know, USA junk food. He is an habitué of this nice Greek island since twenty years and, as my son had been invited to pass an holiday there with his one, after a week I got their proposal to join them even if – because of dire straits logistics in their rented flat – I had to stay in a Pension called Apelati, an accommodation which my friend thought suitable for me, and a choice which I then appreciated a lot: no mosquitoes, and comfortingly fresher in summer nights than a seaside dwelling. My journey to Greece this year was also felt by me, as by thousands of Italians, as a must: to encourage this nation’s ailing economy, although in my case I was amply rewarded, also in economic terms. As a matter of fact, on my way back to Milano, via Athens, I got acquainted by an Olympic Air hostess that the flight had been overbooked and that the company was offering to the ones accepting to fly on the next day flight – via Wien – a four stars hotel room outside the capital, in Vravrona Bay, Attica Region, back and forth transportation to the airport and, hold your breath, € 250 cash, a donation which I immediately signed for, to enjoy the rest that inevitably you need after a vacation, as a scuba diver needs a decompression chamber after being immersed deep into the sea for a long time. At this point, even if it may sound partisan, I have to say that Olympic Air has made a very good impression on me: new aeroplanes, even the one from Zakynthos to Athens was a brand new Bombardier with leather seats and the food and service, as the one on the route Wien-Milano, was excellent. For sure, we Europeans have to help Greece, a nation from which has stemmed our culture. Even the name Europa (in Greek language Εὐρώπη) derives from this nation’s mythology: as the story goes, she was a woman, living in the island of Crete who was abducted by Zeus in the form of a white bull. I mean, if we let fail this country from which comes our identity, in the long run, I’m sure, the whole Europe project will go awry too. Identity is a force which melts into all our activities, even in the products we exports to more competing countries worldwide, whose citizens will choose to buy those goods also because of the ideas, history and myths conveyed with them. The best way to enjoy a vacation in Keri area is to go there with a rubber dinghy. My friend too has this kind of inflatable boat with which often goes for rod fishing, but this year, because of changing currents – as local fishermen pointed out – few catches were recorded: during countless hours of plying the island coastal waters, slow-trolling with live needlefish as bait, we got only two strong bites from unknown creatures – most probably amberjacks – whose pulling was so strong that in the end they tore the lines. In the above pano shot of Keri harbor (click to enlarge) you can see that it mostly hosts rubber dinghy boats, and small local fishermen trawlers berthed at its artificial concrete quay. A peculiar geologic phenomenon – aeons old – happens in this place: originating from the underlying bituminous limestone strata you can detect surfacing gas bubbles, sometimes as big as an orange fruit, and you can smell the hydrocarbon gases. 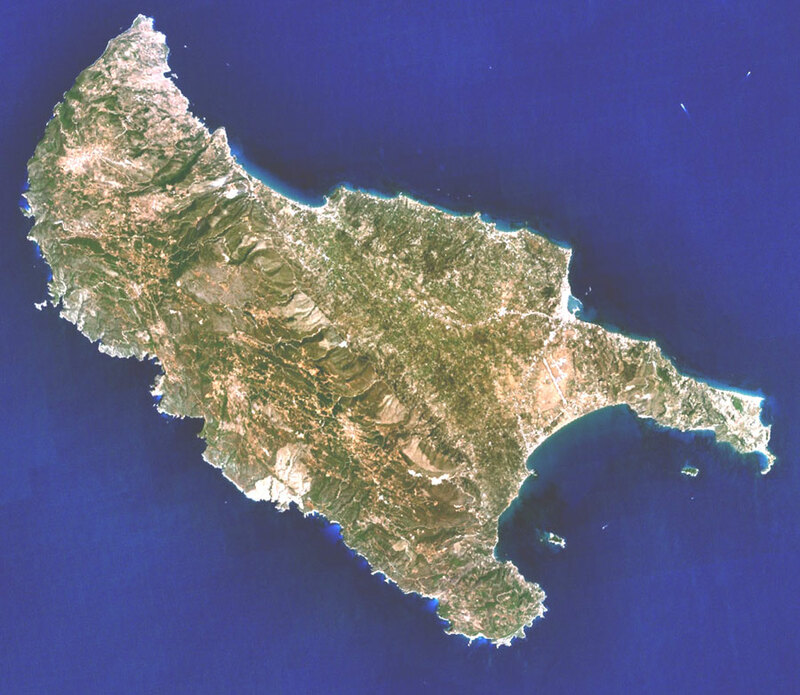 In the same picture, near its center, is visible the turtle shaped Marathonissi Island. The Apelati pension in Keri. In the foreground a rubber dinghy readied to be hauled back to Italy by some Apelati’s customers after the end of their holiday. 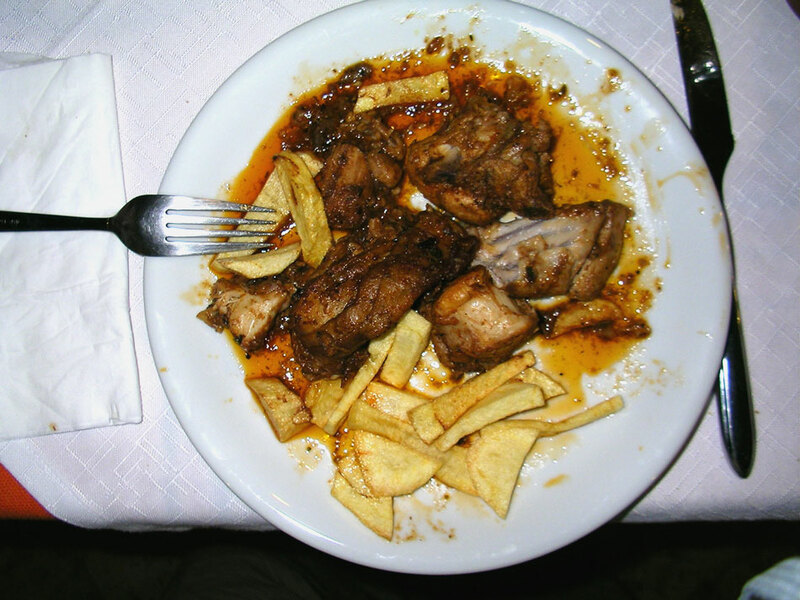 In the pictures above a sequence of typical Zakynthos dishes offered by the pension’s restaurant. 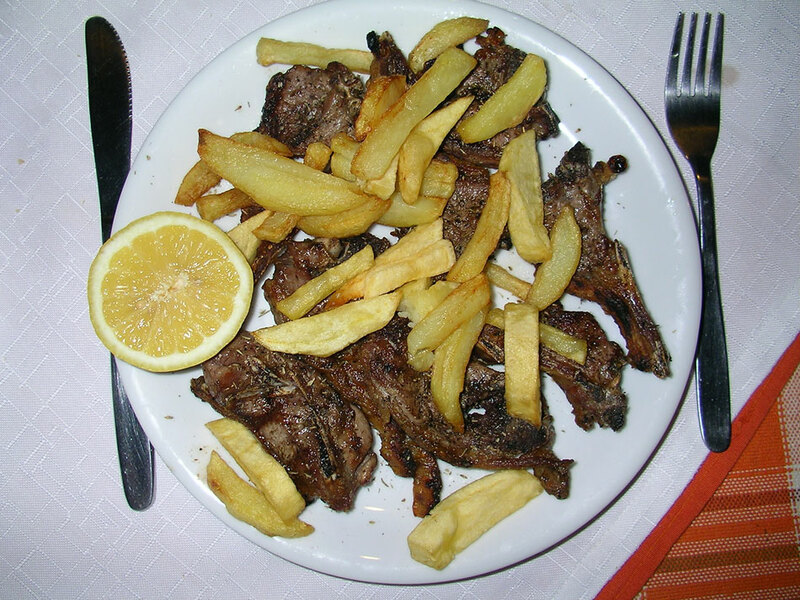 From the top: Lamb chops and French fries; Wild rabbit stew; Stuffed and oven-cooked farmyard raised chicken. 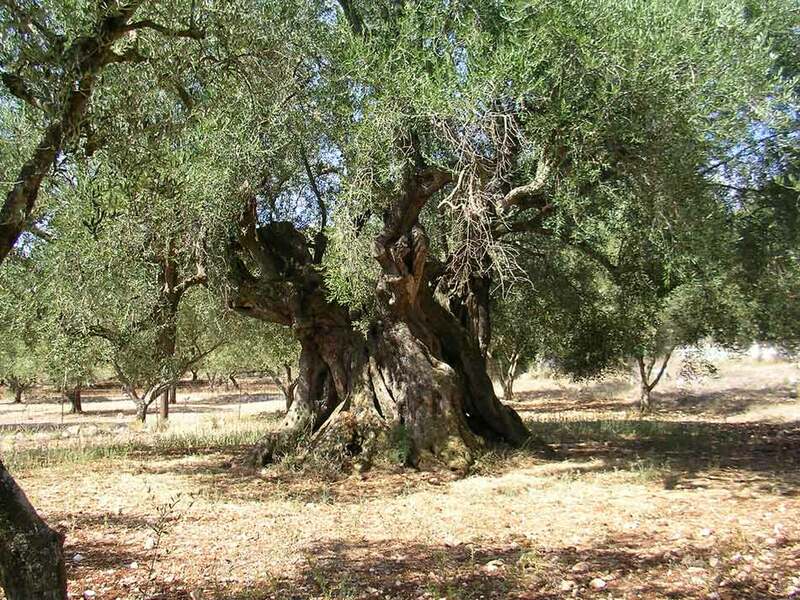 A bi-millenary olive tree. Zakynthos’ olive oil is mild and tasty, therefore it is suited to sprinkle a Greek salad. 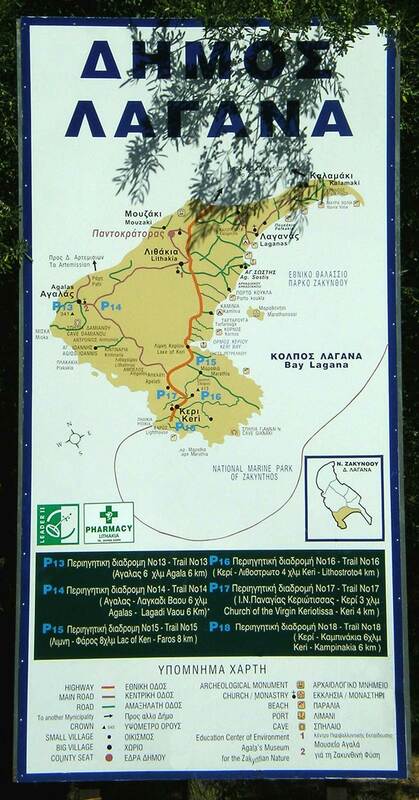 A road map of Lagana’s County in Zakynthos, where Keri lies. The post upper part is covered by the branches of an ubiquitous Olive tree. Two kilometers on the left from this villa view there is Keri harbor, while on the right of the picture you can admire Marathonissi Island, shaped like a turtle; it forms, with its surrounding gulf waters, a marine National Park. The turtles, by the tens, attracted by their huge replica, lay their eggs in its ample beach, quite visible on the island’s tail tip. Unfortunately, because of budget cuts, the Greek Ministry of Environment did not endow the Society for the Turtle Protection with the yearly fund, so their island post was unattended, nor Navy boats were patrolling, as usual, these waters to avoid blast fishing or treading Marathonissi beach. 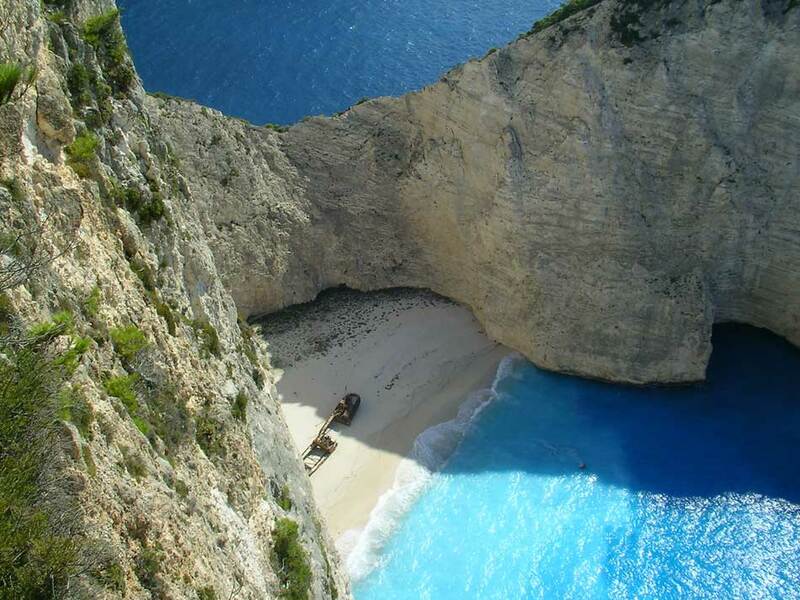 Also a law, to forbid in this area free-diving spear fishing, would be welcomed by residents and eco-tourists alike. Among wuthering wind and high waves we were in search of the elusive Amberjack. 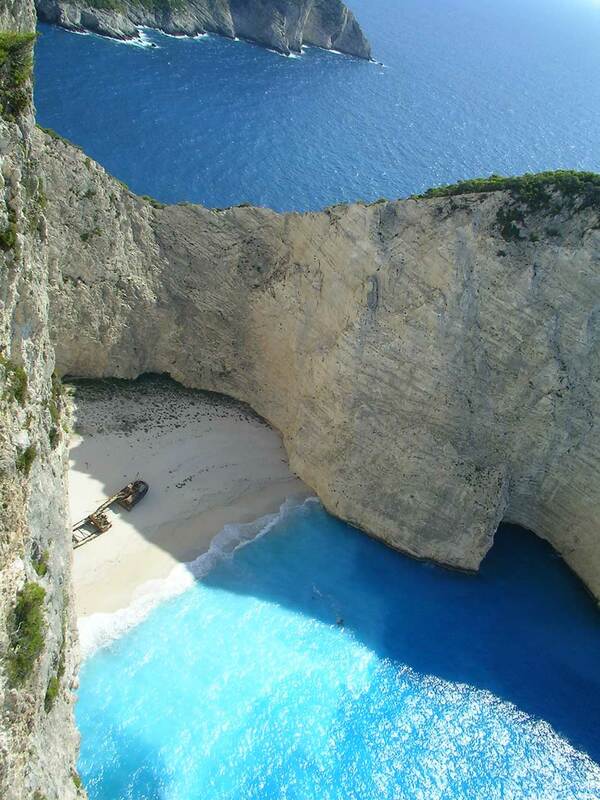 Ulysses may have sailed this beautiful sea: his Ithaca is only few miles away from Zakynthos. 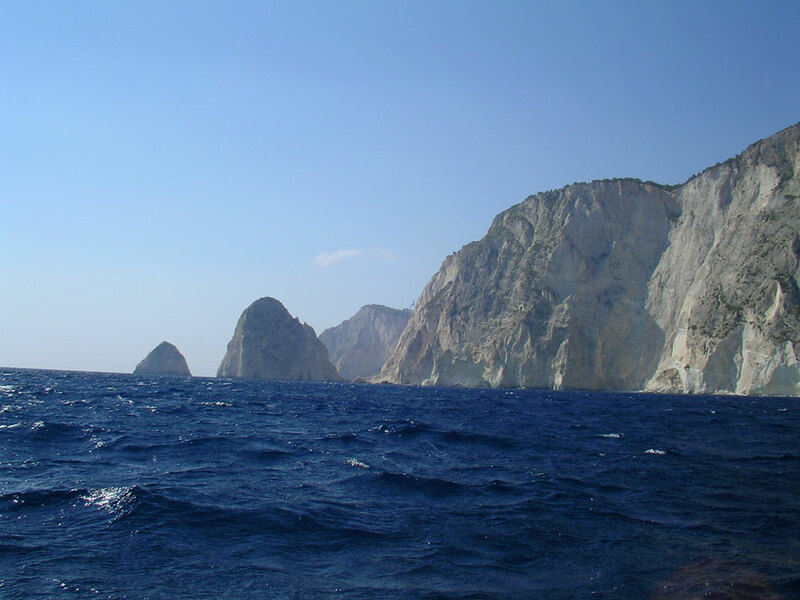 Following the perpendicular line of the rock resembling a castle tower, at the end of the promontory, you will note (click on the picture to enlarge) a small, light brown shape among the waves: it’s a Caretta Caretta turtle’s carapace. The creature, while swimming in the opposite direction, raised its head and looked at us puzzled for some seconds. 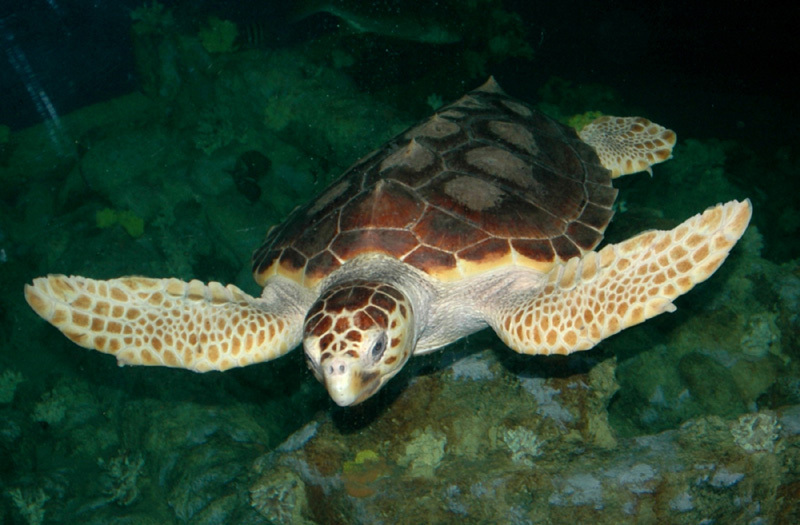 This is a Caretta Caretta turtle, otherwise called Loggerhead. It feeds on sponges, and eats with much gusto a sea creature most feared by bathers; I would say, more than the white shark, because it is present in the sea by the trillions: jellyfish. Its worldwide spreading has dramatically increased due to warmer waters caused by the Greenhouse effect on our planet Earth. Therefore, for the turtle population to thrive, and pack away those venom barbed creatures, we should avoid pollution: sure enough many turtles die eating plastic bags resembling tasty jellyfishes.